This view of the Mono Basin from the north surely contains Sagebrush Sparrows, Pinyon Jays, Greater Sage-Grouse, and many more birds of the fascinating intermountain west. Photo by guide Tom Johnson. This fall marked another grand adventure on our Slice of California tour. We encountered an extended stretch of dry weather but somehow managed to dodge the various fire closures that had plagued the state both before and after the tour. 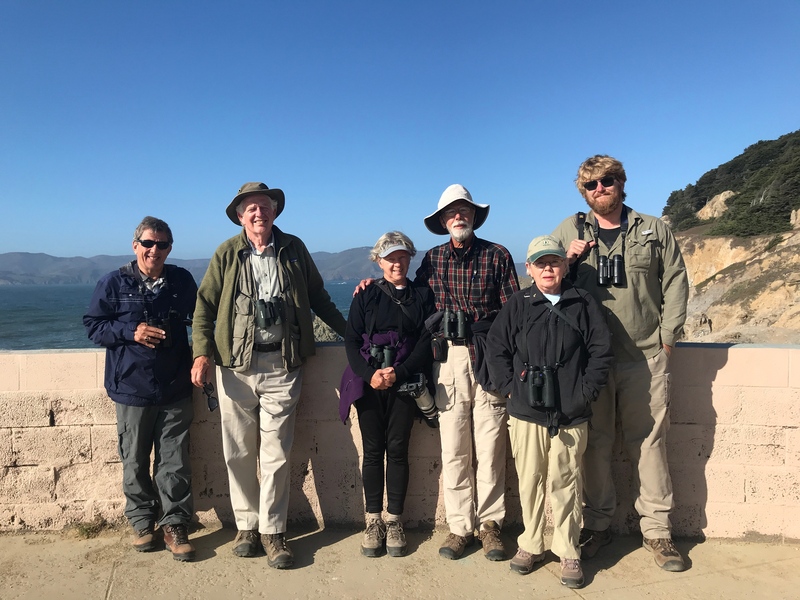 We started out birding along the shores of San Francisco Bay, finding tons of waterfowl and shorebirds and seeing such specialties as Ridgway's Rail, Vaux's Swift, White-tailed Kite, Western Screech-Owl, Nuttall's Woodpecker, and more. We even heard a Black Rail calling at the Alviso Marina (though it remained hidden from sight). Moving to the outer coast at Half Moon Bay, we joined with Chris Benesh's tour for a fabulous boat trip to the rich offshore waters of the region, finding Laysan and Black-footed albatrosses, Ashy Storm-Petrels, Rhinoceros Auklets, Marbled Murrelets, and some incredible marine mammals like Blue Whale, Northern Fur Seal, and more. We also had a day on shore along the outer coast to find specialty birds like Wrentits, Hutton's Vireo, Pacific-slope Flycatcher, Snowy Plover, and to visit the impossibly tall coast redwoods. An eastward drive into the interior of California led to a quick transition in the diversity of birds we encountered. A day on Mines Road and Del Puerto Canyon south of Livermore added tremendously to the trip, with sightings of Yellow-billed Magpie, California Thrasher, Bell's Sparrow, Lewis's Woodpecker, Greater Roadrunner, and Lawrence's Goldfinch. On the western flank of the Sierra Nevada, we explored the giant sequoias of Calaveras Big Trees State Park and their attendant woodpeckers; White-headed Woodpecker, Red-breasted Sapsucker, Pacific Wrens, and Nashville Warblers were some of the highlights there. Upslope in the high Sierra of Bear Valley, we sought and eventually found the very tricky Mountain Quail. A drive across the Sierra Nevada at Sonora Pass was great for scenery, but also produced some top birds like Cassin's Vireo, Hermit Warbler, and American Dipper. This stretch of the adventure led us to the otherworldly landscape of the Mono Basin with its limestone tufa towers, sage deserts, and steep-sided mountains. Here we watched Greater Sage-Grouse, Black-backed Woodpecker, Sagebrush Sparrow, Sage Thrasher, Pinyon Jays, and flocks of Eared Grebes and Red-necked Phalaropes. The final day of the tour included a drive across the whole state of California, but it was fortunately punctuated by several excellent bird sightings. First, as we were about to climb into the Sierra Nevada from the east, a juvenile Mississippi Kite randomly circled low over the road in front of us, offering some fantastic views after we bailed out of the van. This species is very rare in California and was a total shock to me on this tour. We planned the rest of the day to include a visit to a continuing vagrant Eastern Yellow Wagtail along the coast at Rodeo Lagoon, and we had just enough time to stop at the historic Sutro Baths of San Francisco for a fruitful evening search for Wandering Tattler, our final new bird of the tour. Thanks to everyone who made this such a pleasant and rewarding visit to such a diverse cross-section of California. Special thanks to Caroline Lewis for her organizational support from our office in Austin, and to Chris Benesh and Alvaro Jaramillo for scouting information, pelagic wizardry, and general camaraderie. CANADA GOOSE (Branta canadensis) – Widespread on freshwater. CINNAMON TEAL (Spatula cyanoptera) – Just a few sightings, in SF Bay and again on Mono Lake. NORTHERN SHOVELER (Spatula clypeata) – This was one of the most common ducks that we saw along the southern part of SF Bay on our first day of birding (1000+). GADWALL (Mareca strepera) – Seen along SF Bay and on Mono Lake. MALLARD (Anas platyrhynchos) – Widely scattered on freshwater. This California endemic Yellow-billed Magpie was one of several that entertained us on the lower stretches of Mines Road near Livermore. Photo by guide Tom Johnson. NORTHERN PINTAIL (Anas acuta) – Seen both on our first day on SF Bay, and again later at Mono Lake. GREEN-WINGED TEAL (AMERICAN) (Anas crecca carolinensis) – Many were scattered through large flocks of shovelers near Palo Alto and Mountain View; we found a few more on Mono Lake. LESSER SCAUP (Aythya affinis) – A male was slightly out-of-season at Coyote Point on SF Bay. HARLEQUIN DUCK (Histrionicus histrionicus) – A long-staying male was at Coyote Point on SF Bay. SURF SCOTER (Melanitta perspicillata) – Ours were on SF Bay and on the outer coast at Half Moon Bay. MOUNTAIN QUAIL (Oreortyx pictus) – After a close miss with a calling bird near Bear Valley in the Sierra Nevada, we came across a flock of these mysterious and highly-desired quail feeding along a roadside. CALIFORNIA QUAIL (Callipepla californica) – Great views at Del Valle Reservoir. 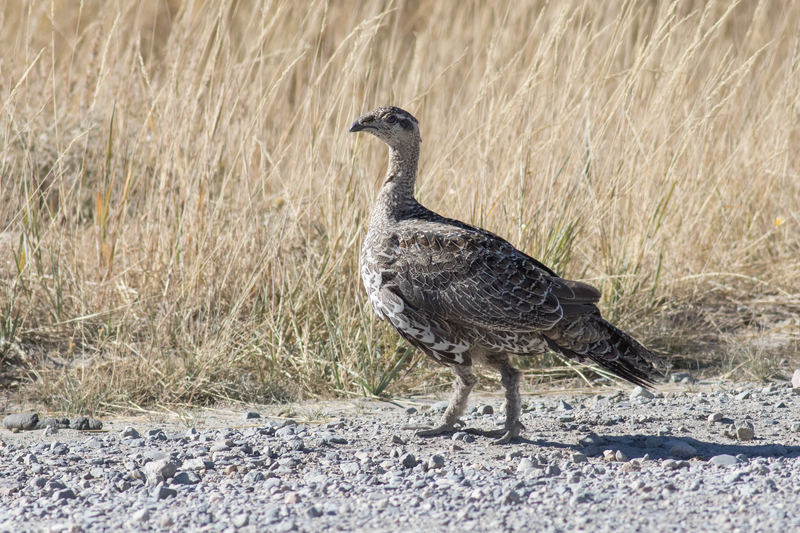 GREATER SAGE-GROUSE (Centrocercus urophasianus) – After our tour of the ghost town of Bodie, we took a stroll through the sage and found these magnificent grouse in a well-camouflaged flock. RED-THROATED LOON (Gavia stellata) – A few of these slim loons were in Half Moon Bay. PACIFIC LOON (Gavia pacifica) – We saw this elegant loon just beyond the surf line at Half Moon Bay. COMMON LOON (Gavia immer) – Our only sightings were from the boat just outside of the harbor in Half Moon Bay. PIED-BILLED GREBE (Podilymbus podiceps) – Our first was near Half Moon Bay; another was at Del Valle Regional Park. HORNED GREBE (Podiceps auritus) – One at Coyote Point Park was slightly unseasonal. EARED GREBE (Podiceps nigricollis) – Quite common at Mono Lake, where this species gathers in great numbers. 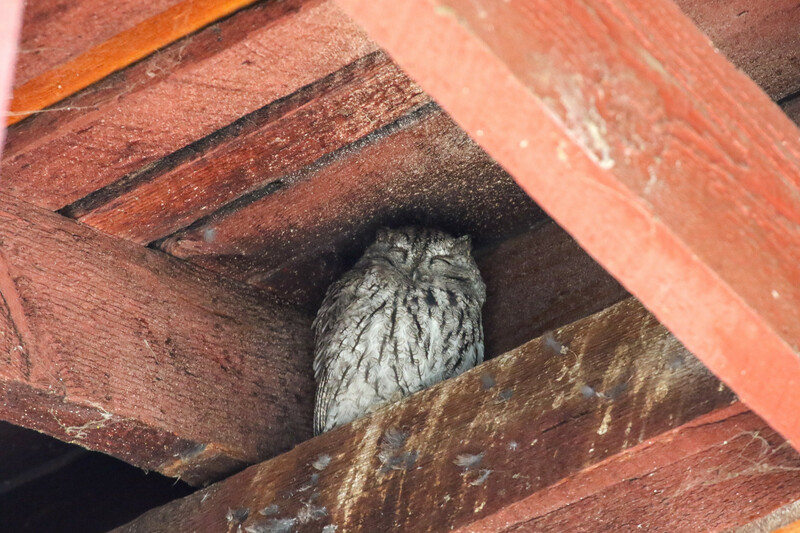 This Western Screech-Owl was roosting at McClellan Ranch Preserve in Cupertino. Photo by group member Mary Lou Barritt. WESTERN GREBE (Aechmophorus occidentalis) – Several good sightings, including some just beyond the surf in Half Moon Bay. CLARK'S GREBE (Aechmophorus clarkii) – A few showed off their bright bills and extensively white faces and flanks at Coyote Point. LAYSAN ALBATROSS (Phoebastria immutabilis) – A banded individual was one of the rarest birds that we found on our pelagic trip off Half Moon Bay. This was likely a bird from the very small Mexican breeding population. BLACK-FOOTED ALBATROSS (Phoebastria nigripes) – Our pelagic trip put us in the world of this lovely chocolate-brown albatross, and we enjoyed several at fairly close range. NORTHERN FULMAR (Fulmarus glacialis) – Unusually common during the pelagic trip off Half Moon Bay. This species typically arrives here in numbers later in the fall. PINK-FOOTED SHEARWATER (Ardenna creatopus) – This was the large shearwater that we saw repeatedly during the Half Moon Bay pelagic trip. BULLER'S SHEARWATER (Ardenna bulleri) – We had a few quick sightings of this gray-and-white visitor from the Southern Ocean during our pelagic trip. SOOTY SHEARWATER (Ardenna grisea) – Reasonably common offshore from Half Moon Bay, but not in huge numbers like we experience on some September trips here. FORK-TAILED STORM-PETREL (Oceanodroma furcata) – This northern species made a quick flyby during our pelagic trip. ASHY STORM-PETREL (Oceanodroma homochroa) – In the apt words of Carolyn, this was the "dark needle in a blue haystack" during our Half Moon Bay pelagic trip. We had several of these localized storm-petrels (endemic to the California Current) flap by on bat-like wingbeats. BROWN BOOBY (Sula leucogaster) – A young bird made a quick flyby during our return to port on the Half Moon Bay pelagic trip. BRANDT'S CORMORANT (Phalacrocorax penicillatus) – Common on the outer coast, with especially good views in the Half Moon Bay harbor. We watched a couple of late Black-chinned Hummingbirds outside of our hotel's cafe in Lee Vining. Photo by guide Tom Johnson. PELAGIC CORMORANT (Phalacrocorax pelagicus) – Scattered sightings around Half Moon Bay; several of these slender, iridescent cormorants were on the breakwaters as we came back in from our pelagic trip. DOUBLE-CRESTED CORMORANT (Phalacrocorax auritus) – Common in SF Bay and on the outer coast; close views in the harbor at Half Moon Bay. AMERICAN WHITE PELICAN (Pelecanus erythrorhynchos) – These huge birds are fairly common on many large bodies of water in California; they were especially close at Charleston Slough. BROWN PELICAN (Pelecanus occidentalis) – Plenty were on the outer coast and in San Francisco Bay. GREAT BLUE HERON (Ardea herodias) – Widespread; seen almost every day. GREAT EGRET (Ardea alba) – Fairly common; seen on most days, including in the Mono Lake area. SNOWY EGRET (Egretta thula) – Ours were around SF Bay and along the outer coast near Half Moon Bay. BLACK-CROWNED NIGHT-HERON (Nycticorax nycticorax) – Close views of birds along SF Bay and roosting in the cypress grove at Pillar Point. TURKEY VULTURE (Cathartes aura) – Common; seen almost every day. OSPREY (Pandion haliaetus) – A few sightings between SF Bay and lakes on both sides of the Sierra Nevada. WHITE-TAILED KITE (Elanus leucurus) – Great views on our first day along the entrance road to Don Edwards SF Bay NWR; later, we saw a buffy juvenile at the base of Pillar Point. GOLDEN EAGLE (Aquila chrysaetos) – One made a brief pass over us during our Mountain Quail hunt near Bear Valley. MISSISSIPPI KITE (Ictinia mississippiensis) – This was a real shocker! We were leaving the Mono Basin on our final day when I spotted this elegant raptor circling low over the highway in front of us. We pulled off and enjoyed a crisply marked juvenile Mississippi Kite at point-blank range before it drifted off to the south. This is a very rare vagrant in California. NORTHERN HARRIER (Circus hudsonius) – Scattered sightings throughout the tour. This was one of a surprising four Greater Roadrunners that we ran across in the dry grasslands of lower Del Puerto Canyon. Photo by guide Tom Johnson. SHARP-SHINNED HAWK (Accipiter striatus) – A juvenile circled over us at Bear Valley; when we looked again, it had been replaced by an adult Cooper's Hawk! We were able to study photos of the two individuals afterward so that everyone was comfortable with the ID. COOPER'S HAWK (Accipiter cooperii) – A few sightings, including one that swapped a patch of sky with a Sharp-shinned Hawk above us at Bear Valley. BALD EAGLE (Haliaeetus leucocephalus) – A few sightings late in the tour. RED-SHOULDERED HAWK (ELEGANS) (Buteo lineatus elegans) – Ours were between SF Bay and the outer coast near Half Moon Bay. This is the colorful California subspecies. RED-TAILED HAWK (Buteo jamaicensis) – Seen on every day of the trip. 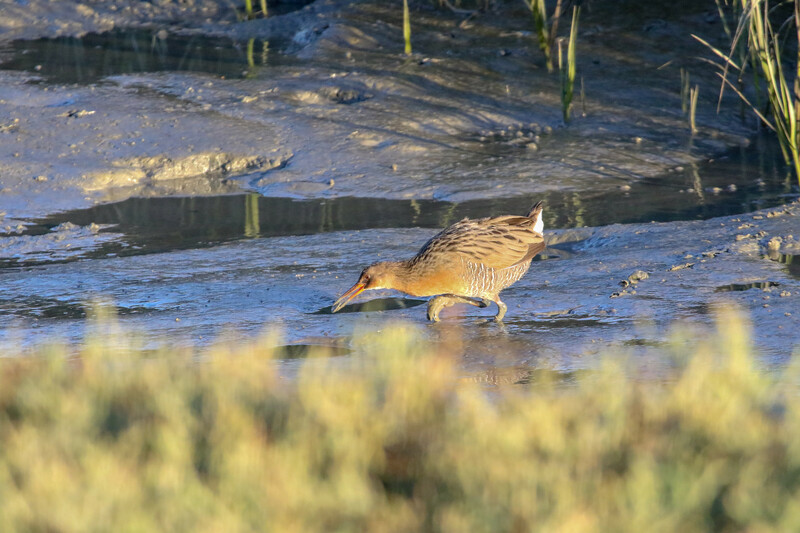 RIDGWAY'S RAIL (SAN FRANCISCO BAY) (Rallus obsoletus obsoletus) – Beautiful views of a bird foraging in a ditch at the edge of saltmarsh at the Palo Alto Baylands. This species resulted from a split of Clapper Rail a few years ago. AMERICAN COOT (Fulica americana) – Just a few sightings of this familar freshwater waterbird. BLACK-NECKED STILT (Himantopus mexicanus) – Our only sightings were along the shoreline of SF Bay. AMERICAN AVOCET (Recurvirostra americana) – We saw these gorgeous shorebirds along the shore of SF Bay and again at Mono Lake. BLACK OYSTERCATCHER (Haematopus bachmani) – Three were at the high tide roost at Coyote Point Park on our first day; on our final evening, we saw another at the Sutro Baths in San Francisco. BLACK-BELLIED PLOVER (Pluvialis squatarola) – Common along SF Bay; a few more were on the outer coast at Half Moon Bay. SNOWY PLOVER (Charadrius nivosus) – One patch of protected beach at Half Moon Bay hosted a roosting flock of these very cute plovers. This Lark Sparrow seemed to be fully devoted to feeding on seeds along a horse path in Half Moon Bay. Photo by guide Tom Johnson. SEMIPALMATED PLOVER (Charadrius semipalmatus) – Our only sighting was on the outer coast at Half Moon Bay. KILLDEER (Charadrius vociferus) – Several sightings scattered throughout the tour. LONG-BILLED CURLEW (Numenius americanus) – Several close birds appeared in front of us along the edge of SF Bay. The ones at the high tide roost at Coyote Point were perhaps the most memorable. MARBLED GODWIT (Limosa fedoa) – A few hundred showed well on SF Bay. BLACK TURNSTONE (Arenaria melanocephala) – We saw these rock-loving shorebirds both on SF Bay and along the outer coast. SURFBIRD (Calidris virgata) – Fairly close views on the rock breakwaters at Half Moon Bay at the beginning of our pelagic trip. SANDERLING (Calidris alba) – A few were along the outer coast near Half Moon Bay and at the Sutro Baths in San Francisco. LEAST SANDPIPER (Calidris minutilla) – These small peeps were fairly common along the shoreline of SF Bay. WESTERN SANDPIPER (Calidris mauri) – This was the most common peep that we found in SF Bay on our first day. SHORT-BILLED DOWITCHER (Limnodromus griseus) – We picked out at least one from the flocks of Long-billed Dowitchers during our first day along SF Bay. LONG-BILLED DOWITCHER (Limnodromus scolopaceus) – Quite common along SF Bay, where their "peep" calls often permeated the soundscape. RED-NECKED PHALAROPE (Phalaropus lobatus) – Our first flocks were seen during the pelagic trip off Half Moon Bay; many more were staging in the alkaline waters of Mono Lake. 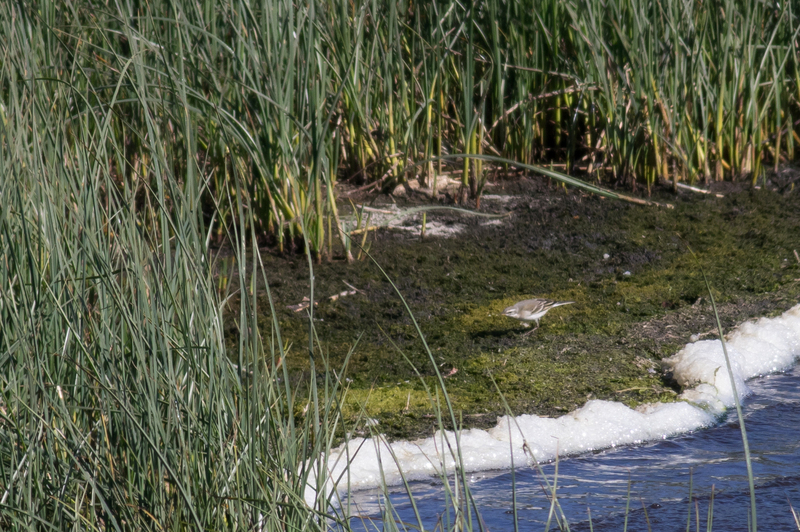 SPOTTED SANDPIPER (Actitis macularius) – Just a few sightings; one on SF Bay and another at Mono Lake. WANDERING TATTLER (Tringa incana) – This was the final addition to our bird list for the tour. We'd missed the species during the initial coastal portion of the trip, but at the end of the tour, we had one more card to play. With just a bit of time on our final evening, we stopped at the Sutro Baths in San Francisco and spotted this shorebird from above as we gazed out at a lovely Golden Gate evening. GREATER YELLOWLEGS (Tringa melanoleuca) – These were the only yellowlegs that we found; ours were seen along SF Bay on our first day. WILLET (WESTERN) (Tringa semipalmata inornata) – Common in SF Bay. SOUTH POLAR SKUA (Stercorarius maccormicki) – This bulky and aggressive seabird made a great flyby during our pelagic trip. 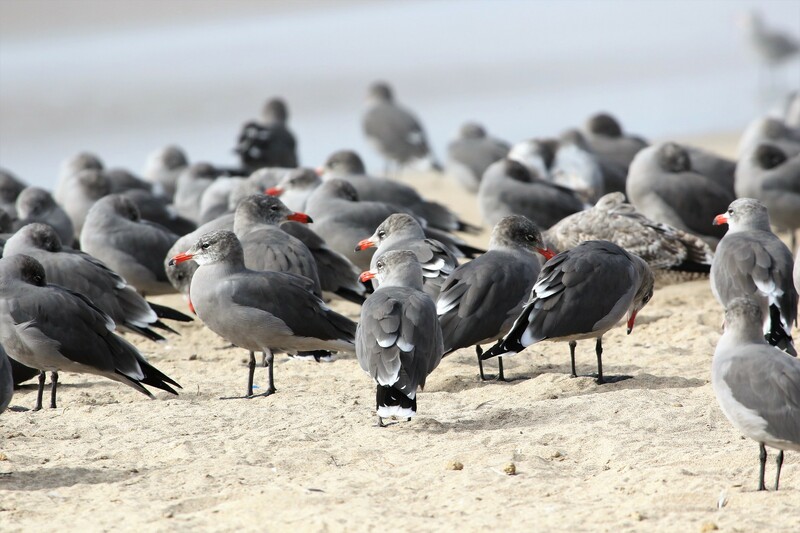 Pomponio State Beach was covered with loafing Heermann's Gulls. Photo by group member Mary Lou Barritt. POMARINE JAEGER (Stercorarius pomarinus) – Repeated sightings at sea during our pelagic trip. PARASITIC JAEGER (Stercorarius parasiticus) – These acrobatic bullies were chasing Elegant Terns over inshore waters off Half Moon Bay. LONG-TAILED JAEGER (Stercorarius longicaudus) – A few of these slim, tern-like jaegers flew by when we were fairly far offshore from Half Moon Bay. COMMON MURRE (Uria aalge) – Common on the water off Half Moon Bay, both on the pelagic trip and as seen from shore. MARBLED MURRELET (Brachyramphus marmoratus) – Shortly after leaving the harbor in Half Moon Bay, we motored through an area favored by these rare and declining alcids, and quickly found some on the water. RHINOCEROS AUKLET (Cerorhinca monocerata) – Good views alongside the boat during our pelagic trip. SABINE'S GULL (Xema sabini) – A few flyby sightings of this long-distance migrant during our pelagic trip. HEERMANN'S GULL (Larus heermanni) – This Mexican breeder was a common sight on the beaches of the outer coast. WESTERN GULL (Larus occidentalis) – Very common in western California, especially along the outer coast. CALIFORNIA GULL (Larus californicus) – Common and widespread at this season; seen both on the coast and inland at Mono Lake. CASPIAN TERN (Hydroprogne caspia) – These massive terns made a few flybys along the outer coast and again at Mono Lake. COMMON TERN (Sterna hirundo) – Examination of the wing patterns of the medium-sized terns during the pelagic trip helped us separate this species from Arctic Tern. ARCTIC TERN (Sterna paradisaea) – Repeated sightings well offshore during our Half Moon Bay pelagic trip. FORSTER'S TERN (Sterna forsteri) – Common on SF Bay; another was on Mono Lake. ELEGANT TERN (Thalasseus elegans) – Common on the outer coast, especially in Half Moon Bay. BAND-TAILED PIGEON (Patagioenas fasciata) – Our first was in Cupertino; later, we saw more on the west slope of the Sierra Nevada. MOURNING DOVE (Zenaida macroura) – We saw many, especially to the west of the Sierra Nevada. 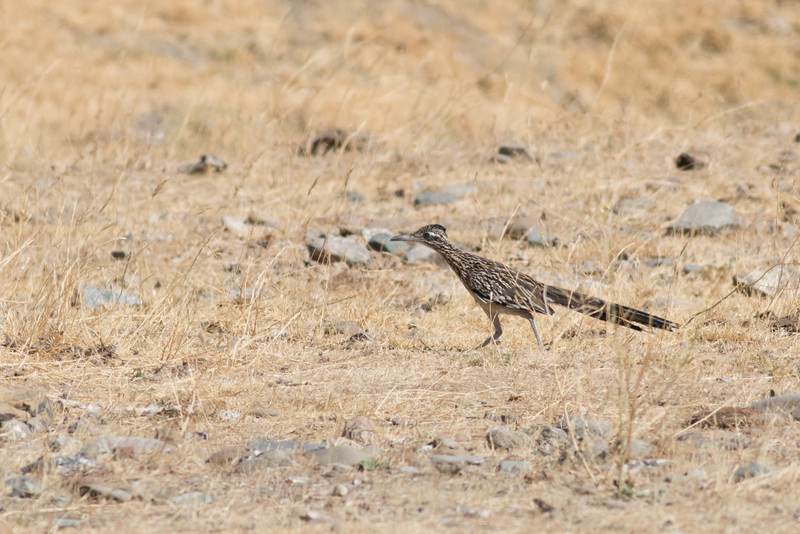 GREATER ROADRUNNER (Geococcyx californianus) – We barely overlap with the range of this species during the tour; however, this year, we found 4 during our exploration of Del Puerto Canyon near Patterson. WESTERN SCREECH-OWL (Megascops kennicottii) – We scoped one on a day roost in Cupertino. 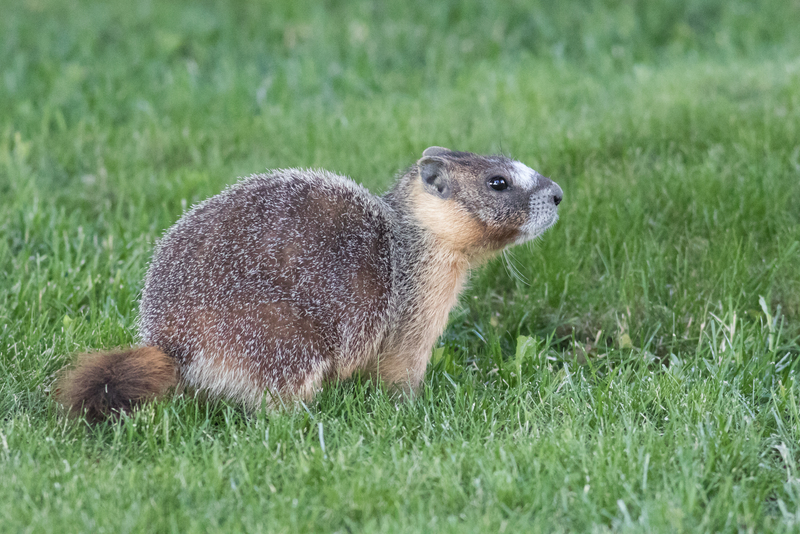 This Yellow-bellied Marmot was helping to keep the grass mowed short at our hotel in Lee Vining. Photo by guide Tom Johnson. GREAT HORNED OWL (Bubo virginianus) – Two were in the big trees in the parking lot of our hotel in Lee Vining early one morning. BURROWING OWL (Athene cunicularia) – We scoped these open-land owls in a ground squirrel colony near Alviso. VAUX'S SWIFT (Chaetura vauxi) – These small swifts were swarming over insect-filled treetops in Alviso on our first morning of birding together. WHITE-THROATED SWIFT (Aeronautes saxatalis) – A few were mixed in with Vaux's Swifts and swallows in Alviso. 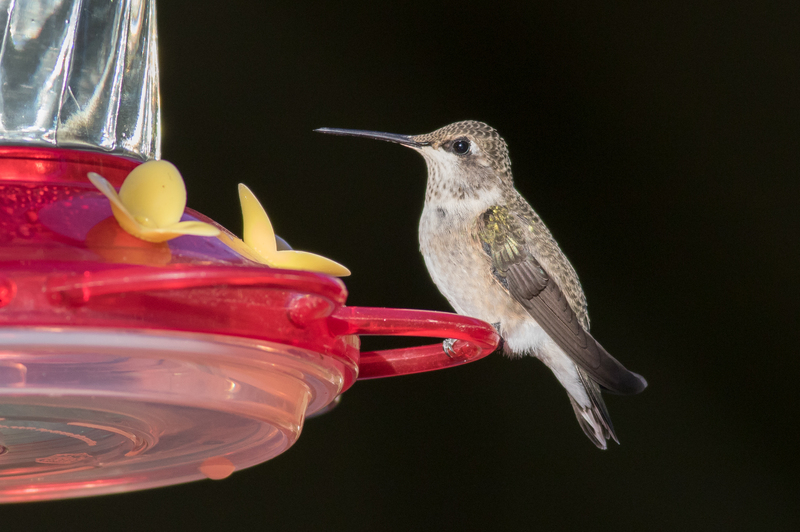 BLACK-CHINNED HUMMINGBIRD (Archilochus alexandri) – During our meals in Lee Vining, we enjoyed studying these lingering migrants at the cafe's feeders. ANNA'S HUMMINGBIRD (Calypte anna) – Fairly common in the Bay Area; we also saw this species at feeders in Lee Vining. RUFOUS HUMMINGBIRD (Selasphorus rufus) – A female came in to the Lee Vining feeders a few times during our visit. BELTED KINGFISHER (Megaceryle alcyon) – A few scattered sightings during the tour. LEWIS'S WOODPECKER (Melanerpes lewis) – Good views on multiple occasions. These beautiful woodpeckers were near "The Junction" at Mines Road and at the Mono County Park. ACORN WOODPECKER (Melanerpes formicivorus) – Just a few between our first in Cupertino and others at our hotel in Sonora. WILLIAMSON'S SAPSUCKER (Sphyrapicus thyroideus) – A beautiful male put in a nice appearance during our Mountain Quail search near Bear Valley. RED-BREASTED SAPSUCKER (Sphyrapicus ruber) – Our best views came in the sequoias of Calaveras Big Trees SP. NUTTALL'S WOODPECKER (Picoides nuttallii) – Good views on a few occasions along the edges of SF Bay on our first day. DOWNY WOODPECKER (Picoides pubescens) – Seen or heard on most days. HAIRY WOODPECKER (Picoides villosus) – We saw this stocky woodpecker both in the Half Moon Bay area and in the Sierra Nevada. 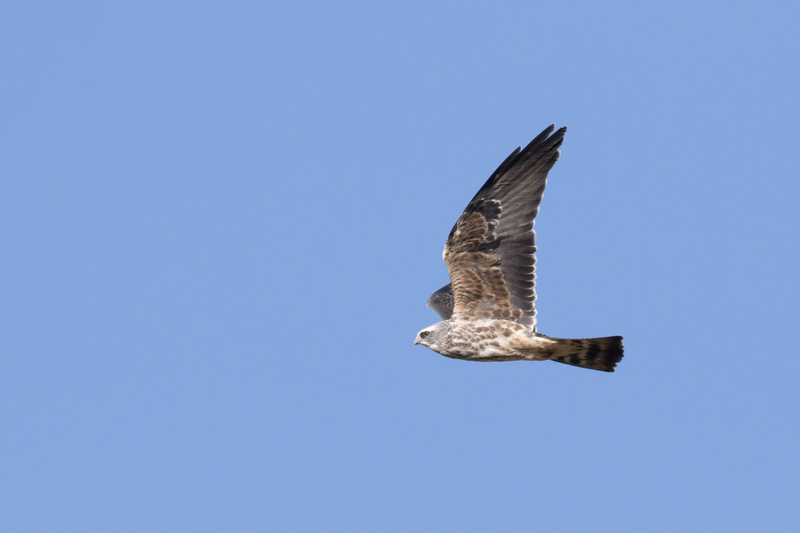 Perhaps the big surprise of the tour was this juvenile Mississippi Kite that circled over the road in front of us as we were about to cross the Sierra Nevada at the end of our tour. Photo by guide Tom Johnson. WHITE-HEADED WOODPECKER (Picoides albolarvatus) – Super views of this striking woodpecker in the giant sequoias of Calaveras Big Trees SP. BLACK-BACKED WOODPECKER (Picoides arcticus) – A male clung to the top of a dead Jeffrey Pine at Inyo Craters on the eastern side of the Sierra Nevada. NORTHERN FLICKER (Colaptes auratus) – Seen and heard on most days of mountain birding. PILEATED WOODPECKER (Dryocopus pileatus) – Good views of this large woodpecker at Calaveras Big Trees SP. AMERICAN KESTREL (Falco sparverius) – Sightings scattered throughout the tour, mostly during our drives. PEREGRINE FALCON (Falco peregrinus) – Two were perched up on towers at Don Edwards SF Bay NWR on our first day together; another was zooming around the base of Pillar Point in Half Moon Bay. WESTERN WOOD-PEWEE (Contopus sordidulus) – We found migrants near Half Moon Bay, along Mines Road, and at Mono Lake. WILLOW FLYCATCHER (Empidonax traillii) – We usually don't cross paths with this Empid during the tour; however, this year we had a particularly nice view along a stream on Mines Road south of Livermore. 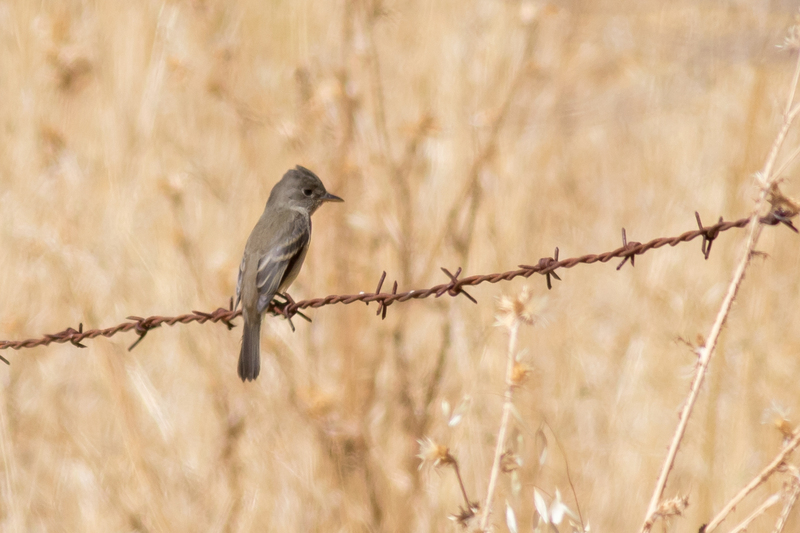 PACIFIC-SLOPE FLYCATCHER (Empidonax difficilis) – Several sightings of these "Western Flycatchers" in the Half Moon Bay area. BLACK PHOEBE (Sayornis nigricans) – These familiar flycatchers were typically found near the edges of freshwater. SAY'S PHOEBE (Sayornis saya) – One was flycatching along the cliffs at Pillar Point; others were seen briefly farther east in the state later in the tour. LOGGERHEAD SHRIKE (Lanius ludovicianus) – The best views were the birds that perched up in the sage flats at the Mono Lake South Tufa. HUTTON'S VIREO (Vireo huttoni) – We had some very nice, close views in the lush, coastal thickets near Half Moon Bay. Early morning sun in Palo Alto lit up this Ridgway's Rail beautifully for group member Mary Lou Barritt. CASSIN'S VIREO (Vireo cassinii) – One called and showed up with a mob of songbirds at Cascade Creek Campground in the Sierra Nevada, but we had a tough time relocating it for better views. WARBLING VIREO (Vireo gilvus) – Several encounters with migrants, including at the Purisima Redwoods, Del Puerto Canyon, and Mono Lake County Park. 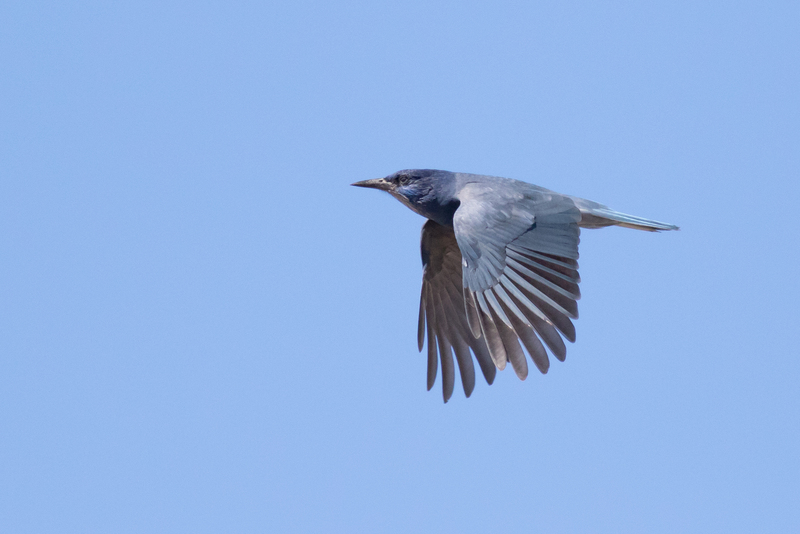 PINYON JAY (Gymnorhinus cyanocephalus) – A flock of ~200 of these comically noisy birds surrounded us during a magical visit to the Jeffrey Pine forest near Mono Mills. STELLER'S JAY (Cyanocitta stelleri) – Common in the montane portions of the tour. CALIFORNIA SCRUB-JAY (Aphelocoma californica) – This Pacific taxon was seen at several places between the coast and the western slope of the Sierra Nevada. 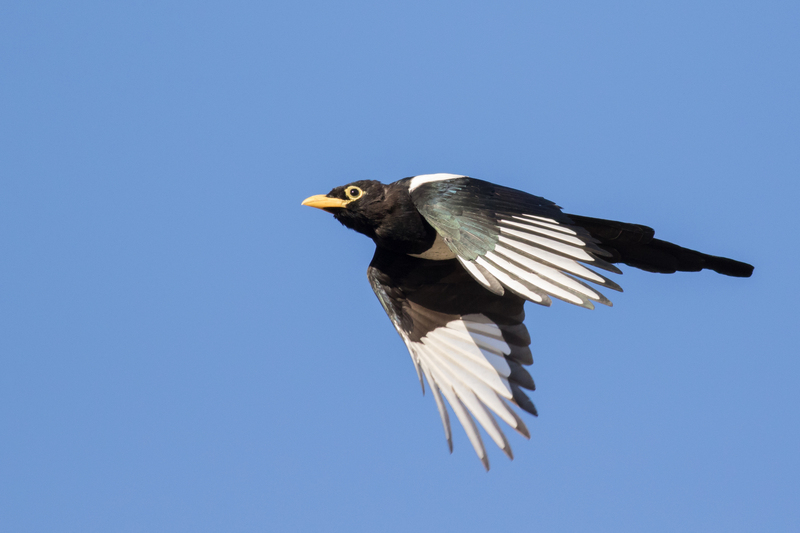 BLACK-BILLED MAGPIE (Pica hudsonia) – Just a few sightings of this familiar western bird in the Mono Basin. CLARK'S NUTCRACKER (Nucifraga columbiana) – These most curious Corvids made daily appearances in the Sierra Nevada, especially at higher elevations. AMERICAN CROW (Corvus brachyrhynchos) – Common and widespread. COMMON RAVEN (Corvus corax) – Seen on all of our days on land (no pelagic sightings!). NORTHERN ROUGH-WINGED SWALLOW (Stelgidopteryx serripennis) – Two were foraging over Rodeo Lagoon on our final afternoon. TREE SWALLOW (Tachycineta bicolor) – About 15 flew past when we were watching from the Mono Lake South Tufa. VIOLET-GREEN SWALLOW (Tachycineta thalassina) – The vast majority of ours were along the shoreline at SF Bay, with ~275 on the wires at Byxbee Park near Palo Alto and another 150 near Alviso. BARN SWALLOW (Hirundo rustica) – Fairly common and widespread. MOUNTAIN CHICKADEE (Poecile gambeli) – These were common companions in the middle and upper reaches of the Sierra Nevada. 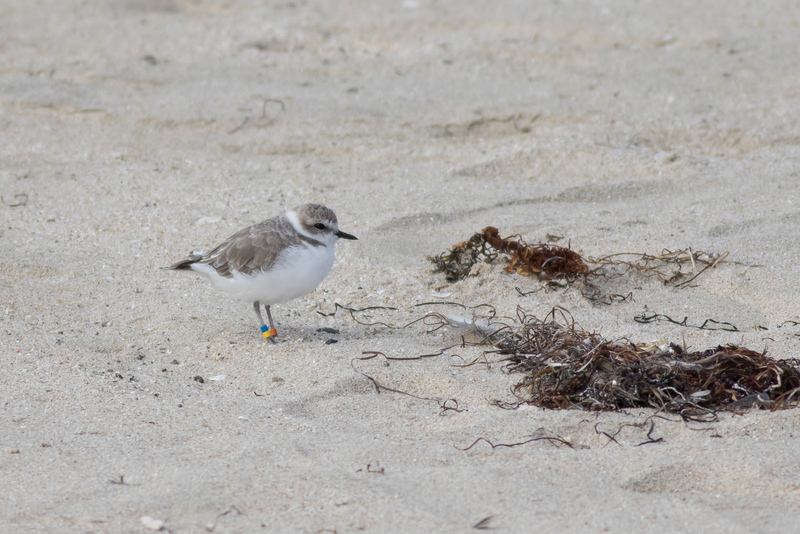 This color-banded Snowy Plover was part of a sizeable flock roosting on a quiet stretch of beach in Half Moon Bay. Photo by guide Tom Johnson. CHESTNUT-BACKED CHICKADEE (Poecile rufescens) – Gray-flanked birds were in suburban habitats along the SW side of SF Bay; chestnut-flanked birds were in the forests on the west slope of the Sierra Nevada (such as Calaveras Big Trees SP). OAK TITMOUSE (Baeolophus inornatus) – Excellent views, including some birds attending a feeder in Cupertino. BUSHTIT (Psaltriparus minimus) – A few bouncy flocks were around the south end of SF Bay at Don Edwards SF Bay NWR and Alviso Marina. RED-BREASTED NUTHATCH (Sitta canadensis) – Common in the Sierra Nevada, particularly at Calaveras Big Trees SP where we found at least 30. WHITE-BREASTED NUTHATCH (INTERIOR WEST) (Sitta carolinensis tenuissima) – The birds we found in pine forests east of the Sierra Nevada were part of this subspecies group. WHITE-BREASTED NUTHATCH (PACIFIC) (Sitta carolinensis aculeata) – These were the White-breasted Nuthatches that we found west of the Sierra crest. PYGMY NUTHATCH (Sitta pygmaea) – These bouncy nuthatches were at Coyote Point Park, Fitzgerald Marine Reserve, and in the Mono Mills Jeffrey Pine Forest. BROWN CREEPER (Certhia americana) – These beautiful and cryptic songbirds put in several appearances at sites with large conifers - and even in the big eucalyptus trees at the Fitzgerald Marine Reserve. ROCK WREN (Salpinctes obsoletus) – One showed nicely on a rocky outcrop as we left Bodie. HOUSE WREN (Troglodytes aedon) – Several were in the coastal tangles near Half Moon Bay, and we saw a few more in the Diablo Range. PACIFIC WREN (PACIFICUS GROUP) (Troglodytes pacificus pacificus) – Our first were against the magnificent backdrop of the coastal redwoods at Purisima Grove; about 14 more (!) were under the giant sequoias at Calaveras Big Trees SP. Two hundred Pinyon Jays provided quite the visual and audio spectacle for us in the Jeffrey Pines near Mono Mills. Photo by guide Tom Johnson. MARSH WREN (PALUDICOLA GROUP) (Cistothorus palustris paludicola) – These were fairly common in the marshes along the SW shore of SF Bay; we also heard one calling at the Mono Lake County Park. BEWICK'S WREN (Thryomanes bewickii) – Heard more often than seen, but we did manage some good views of this widespread wren along the way. BLUE-GRAY GNATCATCHER (Polioptila caerulea) – One was briefly at Parrotts Ferry, but the one at Mono Lake County Park paraded around in front of us at length. AMERICAN DIPPER (Cinclus mexicanus) – By walking down to the river at Kennedy Meadows, we got up close and personal with several American Dippers - a fantastic atmosphere. GOLDEN-CROWNED KINGLET (Regulus satrapa) – Repeated sightings of these little sprites in the Sierra Nevada. RUBY-CROWNED KINGLET (Regulus calendula) – A few of these twitchy little songbirds were mixed with flocks of migrants from the coast to the Sierra Crest. WRENTIT (Chamaea fasciata) – A few of these strange songbirds showed themselves to us near the coast, though we heard far more than we saw. Best views were at Venice Beach in Half Moon Bay. WESTERN BLUEBIRD (Sialia mexicana) – These beauties turned up repeatedly along Mines Road (and again at Rodeo Lagoon on our final afternoon). MOUNTAIN BLUEBIRD (Sialia currucoides) – Our only sightings this year were at the ghost town of Bodie. HERMIT THRUSH (Catharus guttatus) – This one was along the small stream at Mines Road where we also saw the Willow Flycatcher. AMERICAN ROBIN (Turdus migratorius) – Seen on all of our days in the Sierra Nevada. CALIFORNIA THRASHER (Toxostoma redivivum) – A pair of these excellent mimids popped up to have a look at us in dense chaparral along Mines Road. This species is almost entirely restricted to California. This was a great fall for seeing Willow Flycatcher in the Bay Area, and we were fortunate to run into a few birds along the way - this one was "whit"-ing along Mines Road. Photo by guide Tom Johnson. SAGE THRASHER (Oreoscoptes montanus) – We saw these small, streaky thrashers a few times along the shore of Mono Lake. NORTHERN MOCKINGBIRD (Mimus polyglottos) – Scattered sightings along SF Bay and in Half Moon Bay. EASTERN YELLOW WAGTAIL (Motacilla tschutschensis) – This was a stakeout rarity that we saw on our final afternoon together at Rodeo Lagoon in Marin County. Our trip worked out such that we negotiated traffic and saw this Asian songbird with enough time to go find Wandering Tattler before dusk fell. CEDAR WAXWING (Bombycilla cedrorum) – Small numbers this time, including a flock at Don Edwards SF Bay NWR, and a singleton at the Mono Lake County Park. PHAINOPEPLA (Phainopepla nitens) – One of these silky-flycatchers called and put in an appearance near some mistletoe along Mines Road south of Livermore. ORANGE-CROWNED WARBLER (Oreothlypis celata) – Small numbers of migrants were scattered around with flocks of other songbirds. Most of ours were between SF Bay and the outer coast. NASHVILLE WARBLER (RIDGWAYI) (Oreothlypis ruficapilla ridgwayi) – At least 2 of these tail-pumpers were with other warblers at Calaveras Big Trees SP. COMMON YELLOWTHROAT (Geothlypis trichas) – These familiar warblers were in the coastal portions of our tour, and again at the Mono Lake County Park east of the Sierra Nevada. YELLOW WARBLER (Setophaga petechia) – These familiar warblers were feeding in a fennel patch at the Charleston Slough in Mountain View. YELLOW-RUMPED WARBLER (AUDUBON'S) (Setophaga coronata auduboni) – Quite common at a few sites in the Sierra Nevada; scarce elsewhere. BLACK-THROATED GRAY WARBLER (Setophaga nigrescens) – This striking species was in mixed flocks in the Diablos and again on the west slope of the Sierra Nevada. This Eastern Yellow Wagtail was poking along the edge of Rodeo Lagoon in Marin County on our final evening. This stakeout rarity was the first California record in a decade. Photo by guide Tom Johnson. TOWNSEND'S WARBLER (Setophaga townsendi) – These migrants were regular features of mixed species songbird flocks during our tour. Fairly common in Monterey Cypress groves along the coast. HERMIT WARBLER (Setophaga occidentalis) – A few of these striking warblers lingered in the big conifers at Cascade Creek Campground. The species is a fairly early fall migrant, and our tour overlaps the end of the fall window for finding this species in the Sierra Nevada. WILSON'S WARBLER (Cardellina pusilla) – Scattered sightings, including 4 at the Calaveras Big Trees SP. CHIPPING SPARROW (Spizella passerina) – Two migrants showed briefly in a few of the higher portions of the Sierra Nevada that we visited (Bear Valley and Donnell Vista). BREWER'S SPARROW (Spizella breweri) – Several sightings of this pale, slim sparrow in the sagebrush desert of the Mono Basin. 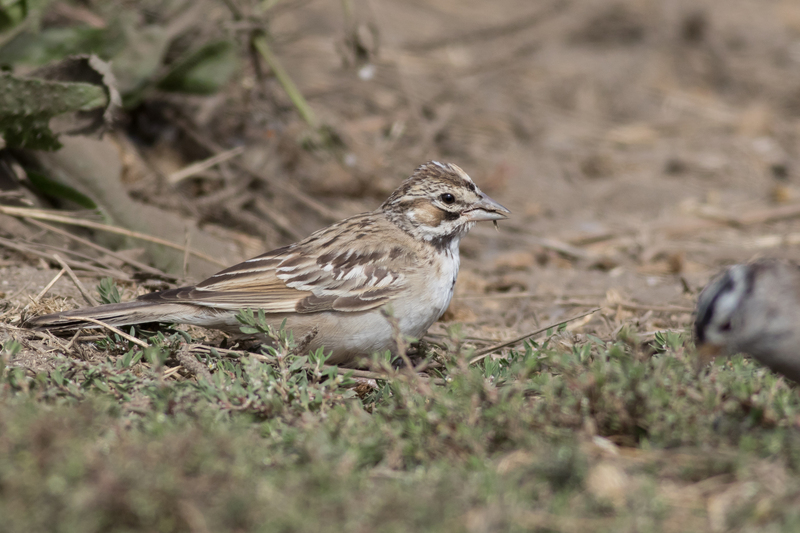 LARK SPARROW (Chondestes grammacus) – We saw an incredibly cooperative vagrant along the coastal trail in Half Moon Bay. The bird scarcely wanted to move out of the path to allow us to walk past. FOX SPARROW (SOOTY) (Passerella iliaca fuliginosa) – The one we saw so well at the Sutro Baths in San Francisco was a newly arrived migrant from the north. FOX SPARROW (THICK-BILLED) (Passerella iliaca megarhyncha) – A few of these California breeders skulked in the manzanita in the Sierra Nevada between Sonora and Sonora Pass. DARK-EYED JUNCO (Junco hyemalis) – Ours were all of the Oregon subspecies group. WHITE-CROWNED SPARROW (GAMBEL'S) (Zonotrichia leucophrys gambelii) – These migrants were arriving in numbers across the state during our tour. These were the pale-lored White-crowned Sparrows with orange bills. WHITE-CROWNED SPARROW (NUTTALLI) (Zonotrichia leucophrys nuttalli) – These White-crowned Sparrows were along the coast at Half Moon Bay. SAGEBRUSH SPARROW (Artemisiospiza nevadensis) – These aptly named sparrows were in sage flats north of Mono Lake. BELL'S SPARROW (BELLI) (Artemisiospiza belli belli) – Good views of the striking coastal Bell's Sparrows along Mines Road south of Livermore. These are more contrasty than the Sagebrush Sparrows that we saw near Mono Lake. VESPER SPARROW (Pooecetes gramineus) – A few birds were in the sage desert of the Mono Basin. SAVANNAH SPARROW (Passerculus sandwichensis) – Frequent sightings along SF Bay and east of the Sierra Nevada. SONG SPARROW (Melospiza melodia) – Fairly widespread along our route; quite common in the southern parts of SF Bay. In addition to a nice tour of the gold-mining ghost town, our time in Bodie helped us find a flock of these magnificent Greater Sage-Grouse. Photo by guide Tom Johnson. LINCOLN'S SPARROW (Melospiza lincolnii) – One popped up in the fennel patch with the Yellow Warblers at Charleston Slough near Mountain View. CALIFORNIA TOWHEE (Melozone crissalis) – Common in the SF Bay area. GREEN-TAILED TOWHEE (Pipilo chlorurus) – These big mountain sparrows showed briefly for us on a couple of occasions in the Sierra Nevada. SPOTTED TOWHEE (Pipilo maculatus) – Several sightings of this widespread western towhee across our tour route. WESTERN TANAGER (Piranga ludoviciana) – Several sightings in mixed flocks of migrants. LAZULI BUNTING (Passerina amoena) – A female foraged on seeds near Pescadero Marsh south of Half Moon bay. YELLOW-HEADED BLACKBIRD (Xanthocephalus xanthocephalus) – A few were perched up on the limestone tufa formations at Mono Lake. WESTERN MEADOWLARK (Sturnella neglecta) – A few were in the sagebrush desert surrounding Mono Lake. RED-WINGED BLACKBIRD (Agelaius phoeniceus) – We saw "Bicolored" Red-winged Blackbirds along the coast south of Half Moon Bay. TRICOLORED BLACKBIRD (Agelaius tricolor) – We tracked down a flock of these declining blackbirds on the coast at Pigeon Point. These birds had likely just arrived to the coast after a short migration from their interior breeding sites. BREWER'S BLACKBIRD (Euphagus cyanocephalus) – Widespread and common, especially along the coast. HOUSE FINCH (Haemorhous mexicanus) – Scattered sightings; especially common around SF Bay. PURPLE FINCH (WESTERN) (Haemorhous purpureus californicus) – These finches put in an appearance at the Fitzgerald Marine Reserve at Moss Beach. CASSIN'S FINCH (Haemorhous cassinii) – A handful perched up above us in treetops on the western slope of the Sierra Nevada. PINE SISKIN (Spinus pinus) – The birds in the parking lot of our hotel gave us the best views of the trip. LESSER GOLDFINCH (Spinus psaltria) – We had scattered sightings between SF Bay and the outer coast. LAWRENCE'S GOLDFINCH (Spinus lawrencei) – It took a bit of wrangling, but we pieced together views of these nomadic finches in the riparian corridor of Del Puerto Canyon on the west side of the Central Valley. AMERICAN GOLDFINCH (Spinus tristis) – Several in the Half Moon Bay area. BRUSH RABBIT (Sylvilagus bachmani) – A few individuals showed briefly in the coastal scrub of Half Moon Bay. NUTTALL'S (MOUNTAIN) COTTONTAIL (Sylvilagus nuttalli) – These were the bunnies east of the Sierra Nevada, in the Mono Basin. DESERT COTTONTAIL (Sylvilagus audubonii) – This was the rabbit species we found at the southern end of SF Bay. Our group at the Sutro Baths in San Francisco on our final afternoon together. Photo by unknown helpful passerby. BLACK-TAILED JACKRABBIT (Lepus californicus) – Our first was on the golf course at Coyote Point; others were in the sage desert surrounding Mono Lake. LEAST CHIPMUNK (Tamias minimus) – These tiny chipmunks were widespread on the east side of the Sierra Nevada, including in open sagebrush habitats near Mono Lake. MERRIAM'S CHIPMUNK (Tamias merriami) – This was the chipmunk that we found in the coastal Santa Cruz Mountains near the Purisima Redwoods. LONG-EARED CHIPMUNK (Tamias quadrimaculatus) – These perky chipmunks were fairly common in the Western Sierra Nevada, including at Calaveras Big Trees SP. YELLOW-BELLIED MARMOT (Marmota flaviventris) – One showed up in the parking lot of our hotel in Lee Vining and seemed to be oblivious to our presence. CALIFORNIA GROUND SQUIRREL (Spermophilus beecheyi) – Common and widely distributed along our journey. This was the grizzled gray squirrel we saw in many open areas across California. EASTERN GRAY SQUIRREL (Sciurus carolinensis) – This introduced species is common in the suburbs surrounding the SF Bay Area. We saw several on our first day together. FOX SQUIRREL (Sciurus niger) – A couple of individuals were along the streets in towns during our journey. The species is introduced in various areas of the west. WESTERN GRAY SQUIRREL (Sciurus griseus) – A few sightings as we drove through the huge conifers of California's beautiful mountains. CHICKAREE (Tamiasciurus douglasii) – This charismatic squirrel is also called the Douglas Squirrel. PACIFIC WHITE-SIDED DOLPHIN (Lagenorhynchus obliquidens) – These were the showy dolphins that splashed by a few times while we were offshore; they didn't offer us much for views this time. HARBOR PORPOISE (Phocoena phocoena) – Due to calm conditions inshore, we were able to spot these small gray cetaceans at the beginning of our pelagic trip. DALL'S PORPOISE (Phocoenoides dalli) – A few of us glimpsed these black-and-white cetaceans rushing through the water when we were offshore from Half Moon Bay. BLUE WHALE (Balaenoptera musculus) – Woah - this massive steel blue-gray animal gave itself away with its cannon-like blow. We waited and had some close views of the largest species of animal to ever live on Earth - a rather humbling and uplifting experience. HUMPBACK WHALE (Megaptera novaeangliae) – Several individuals surfaced, showing their knobby backs and pied flukes, during the Half Moon Bay pelagic trip. COYOTE (Canis latrans) – Several sightings, with a particularly handsome individual in a meadow during our drive out from Bodie State Park. LONG-TAILED WEASEL (Mustela frenata) – One zipped across our path in Half Moon Bay, and then showed itself again briefly after a bit of squeaking. CALIFORNIA SEA LION (Zalophus californianus) – Fairly common in inshore waters off Half Moon Bay. NORTHERN FUR SEAL (Callorhinus ursinus) – One popped up to the surface and showed its long whiskers and pointed nose during our pelagic trip. HARBOR SEAL (Phoca vitulina) – A few were our companions in the harbor at Half Moon Bay. NORTHERN ELEPHANT SEAL (Mirounga angustirostris) – One lifted its big head and nose out of the water during our pelagic trip. MULE DEER (Odocoileus hemionus) – We saw the Black-tailed Deer subspecies to the west of the Sierra Nevada, and Interior Mule Deer in the Mono Basin.